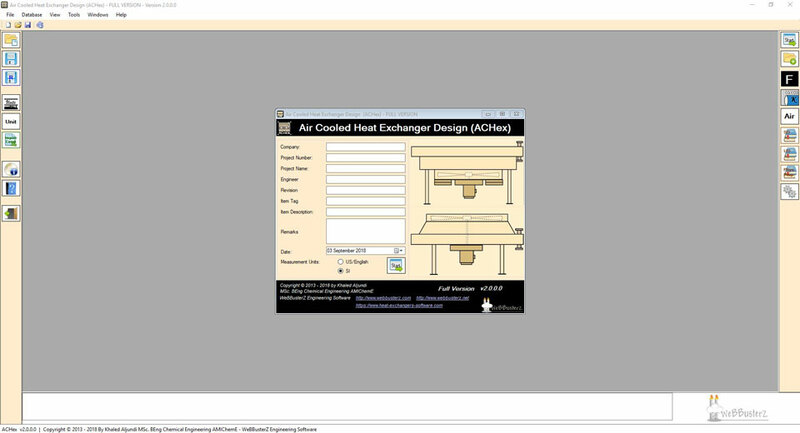 Air cooled heat exchanger sizing software (ACHex) is made to demonstrates the thermal design and sizing calculations of Air cooled heat exchangers. 2. The choice between induced draft and forced draft units. 5. Run unlimited number of trials all will be displayed in results. 6. Calculate the Heat Duty or specify the Heat duty to calculate the hot side mass flow rate. 8. Surface Area for Bare Tubes and Fin Tubes. 12. Calculate the Fin Efficiency. 13. Calculate the Overall Heat Transfer Coefficient (Clean/Design/Required). 17. Air side heat transfer coefficient, you can select between four correlations. Briggs and Young, ESDU, Kern or Ganguli alternatively the software can also accept Nusselt number input if you have calculated it from other correlations. There is also the option of defining the heat transfer coefficient. 19. Calculate the Tube side Pressure Drop, the software uses two different equations and allows you to select between them or opt in to select the highest computed pressure drop. 23. Convert Pressure to altitude and vice versa. 25. Create your own database of fluids/Components, Tubes and Fins. You can add your fluid physical properties, Tube and Fin dimensions and load the data to your project or store them for using on another project. 27. The software produces a three pages summary report of all the results and adds a basic drawing representation of the design the summary can be edited/saved or copied to your own report. 28. The software generates tabulated case trials in two different formats that can also be exported to “.csv” format and opened in Microsoft excel or Open Office. 29. Dry Air properties at atmospheric pressure. Simply input the temperature that you want to estimate the properties at and the software will calculate the Density, Viscosity, Specific heat capacity, thermal conductivity, specific enthalpy, Ratio of specific heats and Prandtl number. 30. Air Density at different set temperature and pressure. Simply enter the temperature and pressure and estimate the density of Air. 31. Estimate the Physical properties of pure components for more than 1450 components; the database has the ability to estimate Thermal Conductivity, Density, Heat Capacity and Viscosity. The database also included critical properties, boiling and melting points and come as separate software but easily integrated with the software. This software supports liquid and gas services only, the software doesn’t support condensation.